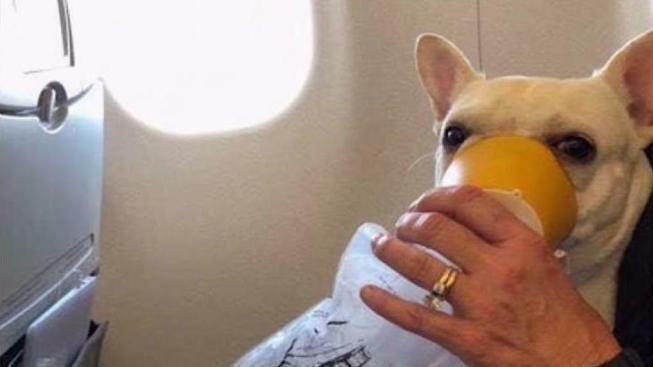 Two JetBlue flight attendants who have a soft spot for French Bulldogs are credited with saving the life of a traveling pup after her tongue went blue during the flight. On a JetBlue flight Thursday from Florida to Worcester, Massachusetts, Michele and Steven Burt's Frenchie, Darcy, started having trouble breathing, Masslive reported. The Burts were traveling with their three dogs when Michele noticed Darcy trying to push her head out of the carrier. Michele unzipped the carrier, allowing the dog to stick her face out. "I noticed that her tongue was blue, and I am aware that is a sign of insufficient oxygen (Hypoxia), so I pulled her out from under the seat and placed her on my lap to cool down and help her relax as she was panicking and breathing frantically," Michele wrote in a letter to JetBlue, which was provided to Masslive. A flight attendant reminded Michele that because of regulations, Darcy had to remain in the carrier under her seat. Michele informed the attendant that her dog needed help. The Burts say crew members Renaud Fenster and Diane Asher are responsible for keeping Darcy alive. After bringing Darcy ice bags to cool her down, she continued to breathe heavily. "Renaud, who explained that he also had a French Bulldog 'Penelope,' brought a small oxygen tank with a mask attached and offered it saying, 'Maybe this will help,'" Michele wrote in the letter. She placed the mask over Darcy's face and she soon became alert again, no longer needing the mask. "I believe Renaud and Diane saved a life, some may reduce the value of life because Darcy is a canine -- I do not," Michele wrote. In a statement released to NBC, JetBlue responded to Michele's letter saying they were glad the crew was so helpful. "Our mission is to inspire humanity, and we're very proud of those outstanding crew members who consistently demonstrate a passion for excellent customer service," JetBlue wrote. This story has been updated to correct the name of a JetBlue crew member.